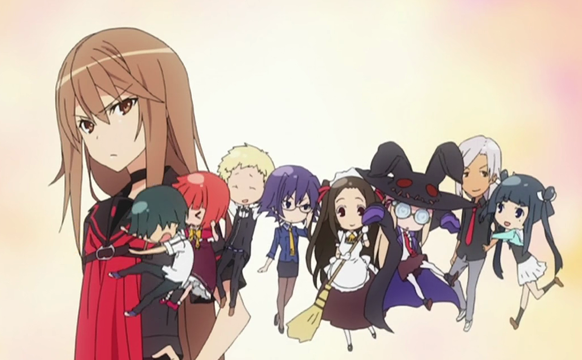 Ookami-san to Shichinin no Nakama-tachi (Wolf and her 7 friends), hereafter Ookami-san, episode 1 succeeds as a parody. both of famous fairy tales, and of the romantic comedy genre. We also got a quick introduction to some of the characters, and a sense of the tone and setting. 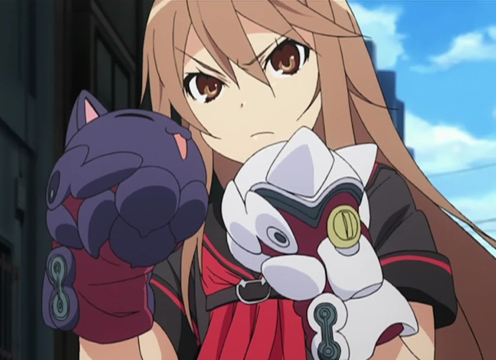 It pretty much goes without saying, with JC Staff on hand, that the animation was attractive and entertaining. 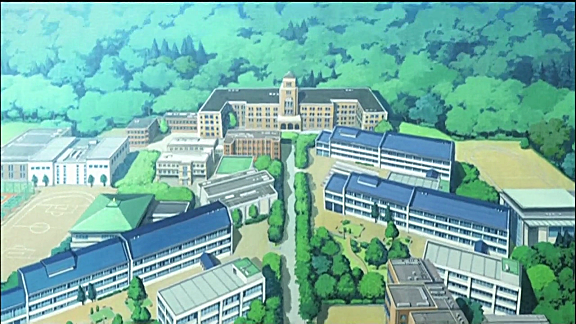 The setting seems to be a vaguely modern fictional city, and more specifically a prestigious school located there. Our protagonists attend that school, and form an unusual club called the Otogi Bank. The tone might be characterized as Comic-tempered Realism; whereas the laws of Physics, etc. are generally respected, the show isn’t afraid to bend the rules for a key point, or comic effect. The best example being an improbable mid-air tumble that occurs late in the 2nd half. 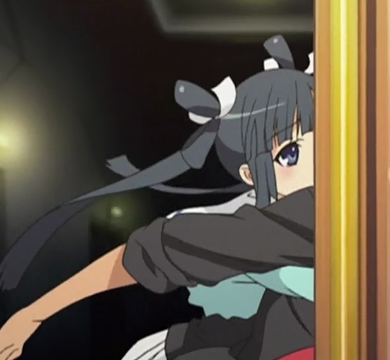 Ryouko and Ringo peer through the "third and a half" wall. 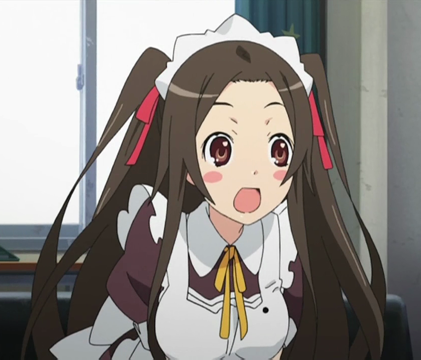 Ookami-san parodies many conventions, and one of the sources of those conventions is the fairy tale. One means of referencing the fairy tale is the use of a strong narrative voice. 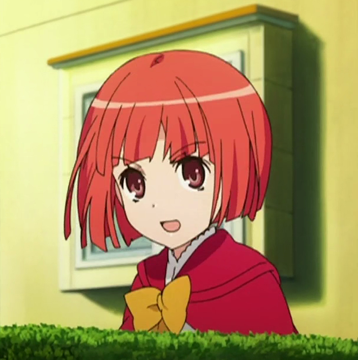 In Ookami-san, the narrator (voiced by Satomi Arai) is more a source of mocking commentary than a transparent medium for useful information. As a result it is also a source of “third and a half wall” humor. 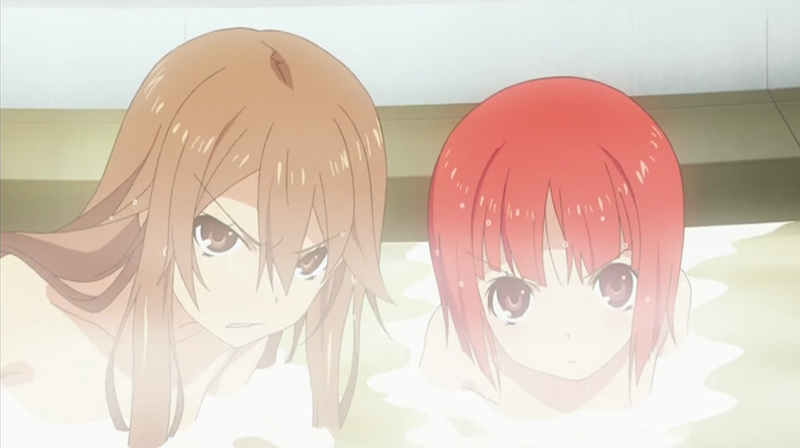 Whereas some shows have “broken the fourth wall” (that is, the wall between the viewer and the scene), in Ookami-san, characters ocassionally undercut the illusion of the scene to express disapproval of the narrator’s commentary. True fourth wall humor involves characters directly addressing the audience, or directly commenting upon their fictive existence. 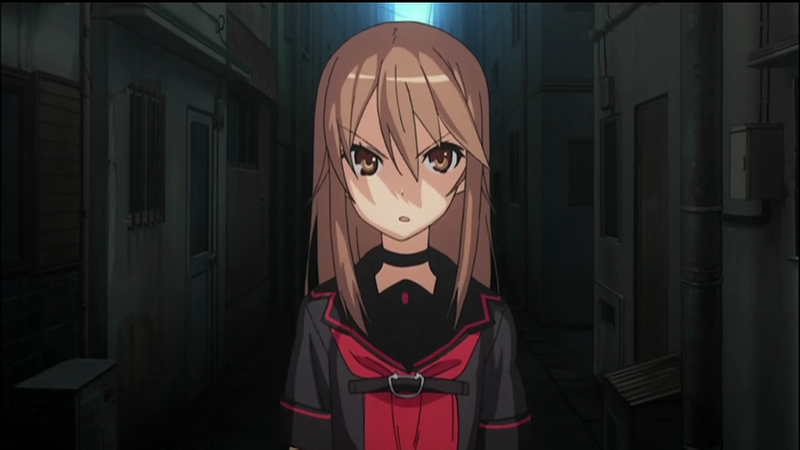 By restricting their disapproving utterances to the narrator, the characters are actually addressing another character in the show (albeit one residing in a meta-layer). A parody of the nosebleed trope! The show has other mechanisms for parodying fairy tales, including a direct parody of Cinderella in the second half. During the telling of that story, Ookami-san parodies a romantic-comedy staple: the nosebleed. In anime, the nosebleed signifies arousal, and the above screen shot, taken out of context appears to be standard usage. In fact, the red across the brow of the nose appears to be blushing, as would be appropriate in a standard rom-com usage. But that ain’t what’s happening, making this the Best Nosebleed Ever! The main couple are extreme versions of rom-com conventions. Ryouko Ookami is about as tsun-tsun as you can get, with barely a hint of a tender side. 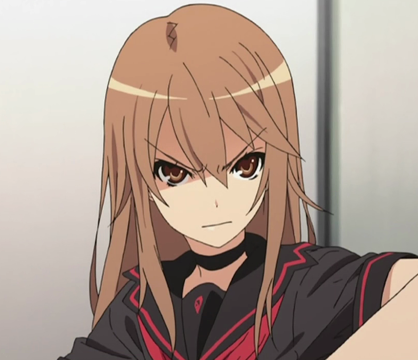 In fact her role in the club, is as an enforcer, she even has a surprisingly good fight scene in the second half. Do kitty gloves count as having a cute side? 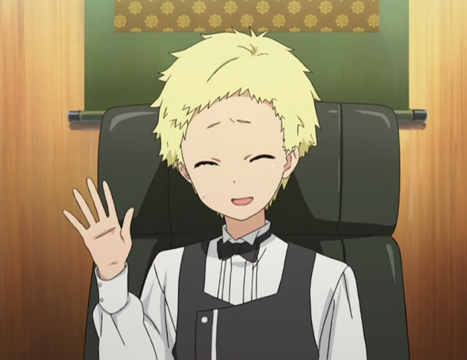 Meanwhile Ryoushi Morino turns the timid male lead trope up to 11. They came up with an interesting explanation; he was raised as a hunter in the mountains in the rural north of Japan, where he learned to hide and stalk his prey (yes, he is literally a stalker), and as a result, he developed scopophobia, the fear of being seen. Anyways, I enjoyed the episode, so I’m just going to leave you with a quick character gloss. Liszt, President of Otogi Bank. Has fetish for returning things. Ookami-san and her seven friends (and Ryoushi). 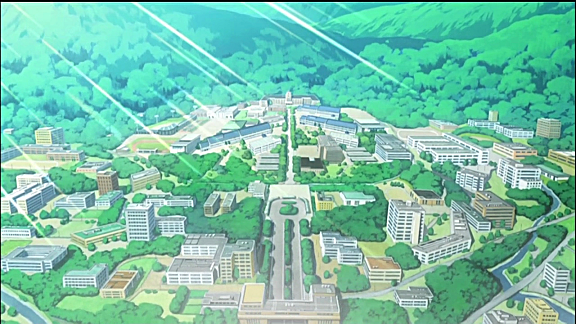 Maybe because it was Kuroko narrating, but did anyone else get an Academy City vibe from Ookami? Just need some espers. Otherwise, it was a pretty fun show, I liked the kooky cast of characters, although Morino’s phobia was getting to be a bit much by the end of the episode. Its not just Kuroko’s narration but this anime is not just parodying fairytales. I’m glad you guys are paying attention to this show, because so far it seems to be off to a good start. I have seen complaints that it is too derivative, but I want to see what they do with the setup. It started all fun but after the half, I was like shut up you old hag and let me hear what the characters want to say! The characters are definitely well drawn and this has it fun moments, hopefully there would be more ups than downs. 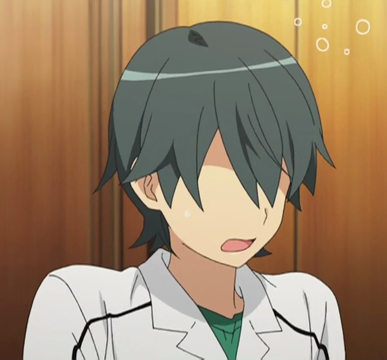 I’m going to need a light-hearted show to balance out Shiki. I love these characters. Alice especially. Sure, she hasn’t done much yet, but she doesn’t have to. 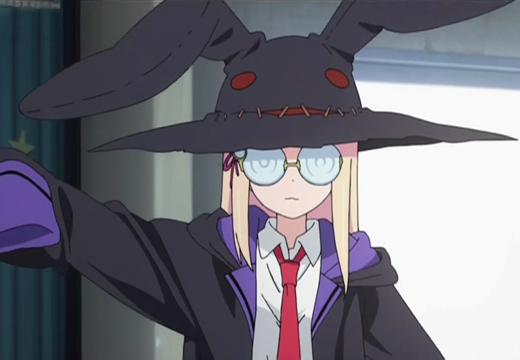 She’s awesome (Yui Horie is too). Yeah, I hope Alice does something awesome as well. 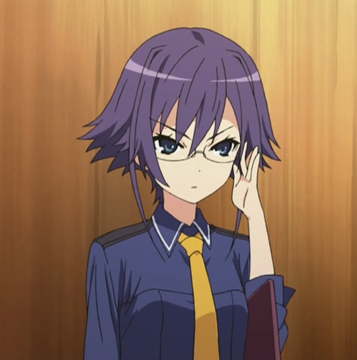 She has a great character design. Haha! 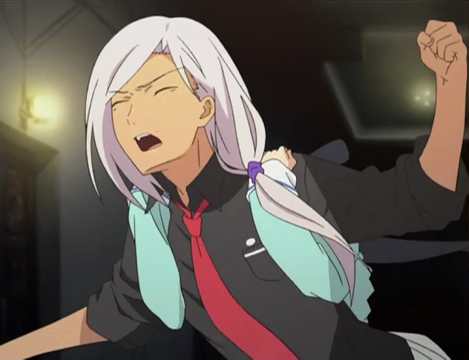 Hell yeah to the nosebleed trope xD I really liked the Cinderella parody in this…. but for the rest of such… whut. People seem to like the Cinderella part the best. Maybe this was just a case of me going in with low expectations, but I really enjoyed the first episode. You managed to analyze a lot of stuff I didn’t catch– like the nosebleed parody, haha. I guess they’re not truly breaking the fourth wall, either, but I like how they’re poking fun at the standard romantic comedy. I hope it continues to take itself lightly, can’t see drama working well in a setup like this. I agree. Besides, I want some silly Summer fun. The main show I’ll be following, Shiki, seems like it will be DARK, so a light-hearted rom-com is very welcome. Milk drinking parody from Shugo Chara! The boxing gloves are a funny idea. Sometimes when she is walking around, you can see them hanging off her waist, behind her back. There is something in what you say, however, I think one of the main reasons Holo can so easily tease, is that she is much older. Ryouko doesn’t come across as more mature (or ‘wise’) then Ryoushi, so, to me, the two relationships have a very different feel to them. Hi to everybody who is dropping in here. I guess you are enjoying Ookami-san. This post turns out to be my most popular post of all time, despite the fact that it is less than a year old, as I type this. I’m not quite sure who you all are, folks who are considering whether they should watch it, or if you are already fans of the show. Either way, I’m glad you stopped by. For those contemplating whether they should watch this show or not, just ask yourself if you want to see a fun little show about a girl with a troubled past who finds a guy brave enough to declare his love, despite her tough as nails demeanor. Yeah, it’s a sweet show, with some humor. Isn’t that what you’re looking for?